Did you know that how you design or set up your home office can affect your productivity? That is why it is important to make sure your desk is equipped and organized to facilitate work and focus. Listed below are 10 must-have desk accessories that any office worker should own if they want to combine productivity and workspace aesthetics. Today, many home business owners use a laptop or a tablet device over a computer in their home business. They are portable, yet powerful. But to increase productivity, you may think of adding a matching laptop and keyboard stand to your desk set up. Choose laptop and keyboard stands that have ergonomic designs. This way, you do not have to worry about getting carpal tunnel syndrome or developing bad sitting posture. 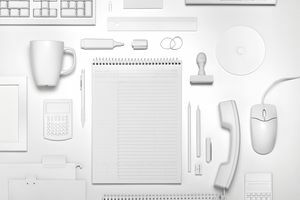 The key to having a desk setup that will help improve your work productivity is by choosing desk accessories that enhance productivity without cluttering the workspace. One such accessory is a smartphone and cord holder or stand, which not only keeps your phone within easy reach but also, can double as a wire organizer and charger. Even if most of your writing is done digitally, it is still important to keep analog equivalents from time to time. As a result, having a pen and paper holder on your desk makes it easy to jot notes, to-do lists, shopping lists, or just simple reminders. Most computers and laptops have their own built-in speaker systems; however, this may not be enough, especially if you need to listen to audio files, do online trainings, or simply enjoy listening to music while you work. Portable speakers can offer improved sound quality and are available in various shapes, sizes, and functionalities. Another often-neglected yet important desk accessory is a desk clock. The clock on your smartphone or laptop may not be enough to keep you aware of the time. Today, there are portable desk clocks that have additional functionalities, such as Bluetooth connectivity, LED displays, smartphone charging, and more. Choosing a multi-function desk clock will help keep your desk clutter-free. The key to productivity is to maintain a clutter-free work desk, which can be a challenge if you have a lot of tools, reference materials, and paperwork. Keep your reference books and files corralled on your desk with bookends, and file holders or trays. For example, if you are a web designer, you can add printed versions of your website design portfolio examples on your desk. But remember not to overdo this. Choose only a few books or files that you feel you will need frequently, and organize them so that they’re in easy reach, but don’t get in the way of working. Sometimes, office desks can get drab and boring, especially if you only have your laptop or computer monitor to stare at the whole day. Add color and inspiration with a picture frame of your friends or loved ones. You can choose a traditional wooden or metal photo frame. Alternatively, you may use a digital photo frame that allows you to create a slideshow of your favorite pictures like the Instacube. Also, you can choose a multipurpose photo frame that can be used as a pen holder and also has device charging slots. No one can deny the importance of a sturdy mug or tumbler to hold coffee or tea for a caffeine boost. Choose a mug or tumbler that is sturdy, spill-proof, drop-proof, and dishwasher-safe. A pretty design will add colorful decor to your desk as well. Desk lamps are a crucial accessory even if you have good lightening in your home office. Not only can it help prevent eye strain, but also, it can offer design flair. There are inexpensive but well-designed options at Ikea and your local Target. Aside from choosing a desk lamp with a creative design, also make sure to use a good light bulb such as Apple’s Night Shift and Helia. Working for yourself can be stressful, which can impact productivity. For that reason, you should set up your office workspace so that it’s functional, as well as inspiring. For those times when you begin to feel overwhelmed or stressed, reach for a stress ball or a game cube, such as a Rubik’s cube. These items can release stress, and calm and refocus a busy mind. Desk accessories can enhance your work area to help you be more productive. The above 10 items can keep you organized while also offering color and inspiration. Author bio: Lisa Smith, is a freelance graphic designer, writer, and blogger.